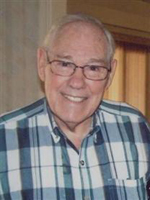 Melvin Ray Karr, age 77 from Lubbock, passed on June 26, 2010. Karr bred and raced Quarter Horses in Texas. Born January 16, 1933 in Chillicothe, Missouri to Frank C. Karr and Golda Karr. Mel was stationed in Germany from 1953 to 1955 while participating in the armed services. Upon returning home he married Lulabelle (Lou) I. Brown on June 2, 1957 and remained married for the next 54 years. In 1959, Mel received his Bachelor's Degree from the University of Missouri in Animal Science. In 1960, he received his Masters Degree from the University of Missouri in Animal Nutrition. Mel earned his Ph.D from the University of Illinois in 1964 in Animal Nutrition with minors in Biochemistry and Physiology. Mel conducted research and taught at the University of Kentucky for one and a half years before moving to St. Louis, Missouri to work for Ralston Purina as a Beef Cattle Consultant and in their research Depatrment for four and a half years. In 1970, Mel moved his family to Lubbock, Texas to set-up his Beef Cattle Nutrition Consulting business. He operated a successful business for the next 38 years. In 1972, Mel began breeding Quarter Horses for show, Cutting and then racing. Breeding and racing Quarter Horses remains a family business. Those left to cherish his memory are his loving wife Lulabelle (Lou) Karr, a son Kendall Karr, his wife Trish, and a daughter Kathy Runnels. Grandchildren; Camille, Christine and Courtney Karr, Jason Runnels and Kyle Martinez. One great grandchild Mackenzie Martinez. Ten brothers and sisters; Dean Karr, Verlin Karr, Eva Mae Pettipier, Juanita Rose, Larry Karr, Frank Karr, Jr., Harold Karr, David Karr, Denny Karr, and Penny Fellars. He is preceded in death by his parents Frank C. and Golda Karr, stepmother Adeline Karr, a sister Mildred Chase and two brothers Donnie and Johnnie Karr. Aldersgates United Methodist Church in Lubbock was Mel's spiritual home, which he loved very much. The family suggests memorials be made to Aldersgate United Methodist Church, 10306 Indiana Ave., Lubbock TX 79423. The funeral service for Mel was held on Tuesday, June 29 at Resthaven's Abbey Chapel.